A brave coyote pup comes to check out the strange camera equipment in Canada, North America. It will not take long for this coyote pup seen in Canada, North America to grow into his large ears. A coyote pup is usually born in late April through early May where it spends the summer with its family and then come Fall heads off to find its own residence. It is possible for a coyote to be able to breed at the age of one but very few do as being a pup seems to be more fun. Coyote Puppy, Canis Latrans, Canada, North America. 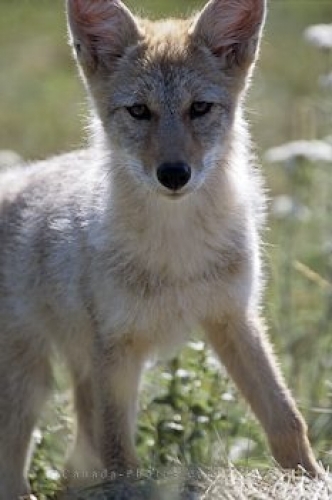 Picture of a cute coyote pup in Canada, North America.